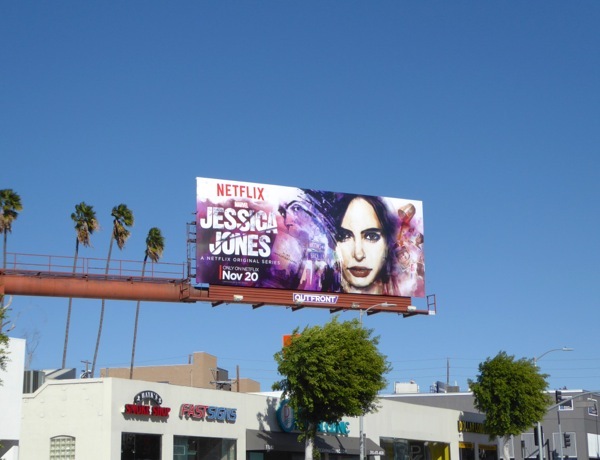 Just one more day and the world gets to meet Marvel's newest small screen sensation, 'Jessica Jones'. This fan-favourite hard-drinking, mistake-making detective crashed onto the scene in 2001 in the Alias #1 Marvel Comics book created by writer Brian Michael Bendis and artist Michael Gaydos. 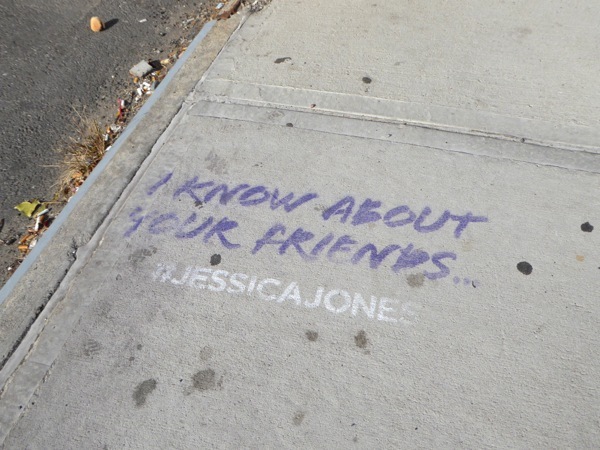 Unlike other tights and capes characters, Jessica Jones is a failed superhero who runs her own Alias Private Investigations, haunted by a dark past that involves master manipulator, 'Kilgrave the Purple Man'. The show is the second entry in Netflix's original Marvel series, existing in the grittier streets of Daredevil within the Marvel Cinematic Universe. 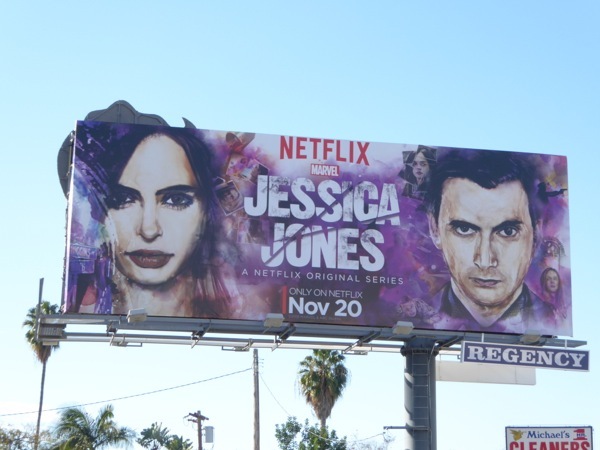 Krysten Ritter has been wonderfully cast as the acerbic, no-nonsense investigator and Doctor Who's David Tennant has switched to the dark (or purple) side, to play her infamous nemesis, 'Kilgrave'. The TV adaptation also features The Good Wife's Mike Colter as the Hero for Hire, 'Luke Cage' (soon to have his own Netflix series), 666 Park Avenue's Rachael Taylor as 'Trish "Patsy" Walker' (aka Hellcat in the comic books) and The Matrix Trilogy's Carrie-Anne Moss as the gender-swapped character 'Jeryn Hogarth' (who appeared in male form in Iron Fist, helping to pave the way for the mystical martial artist's own Netflix series). 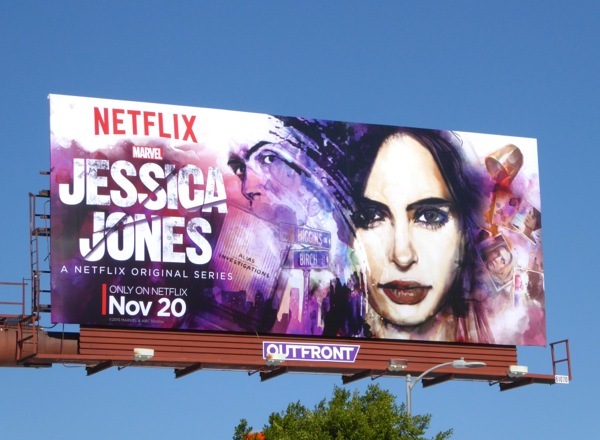 The launch ad creative for the series formerly known as 'aka Jesssica Jones' will please fans as it mirrors the cover artwork of David W. Mack using Krysten Ritter's face. 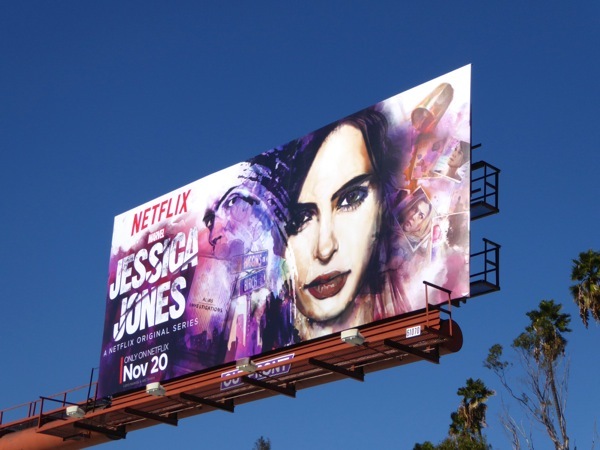 This Jessica Jones billboard was spied along Santa Monica Boulevard in West L.A. on November 16, whilst the clever purple sidewalk graffiti teasing the series was snapped near the Javits Center in New York City on October 31, 2015. 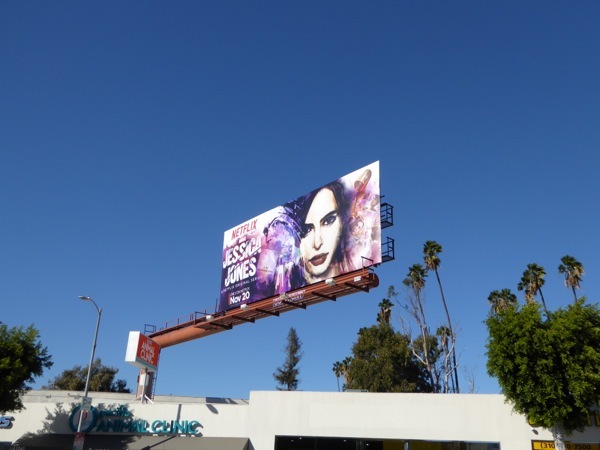 If you're a fan of the actress, be sure to also check her out in these billboards for Don't Trust the B in Apartment 23 from 2012. Move over Supergirl, there's a new superheroine in town. 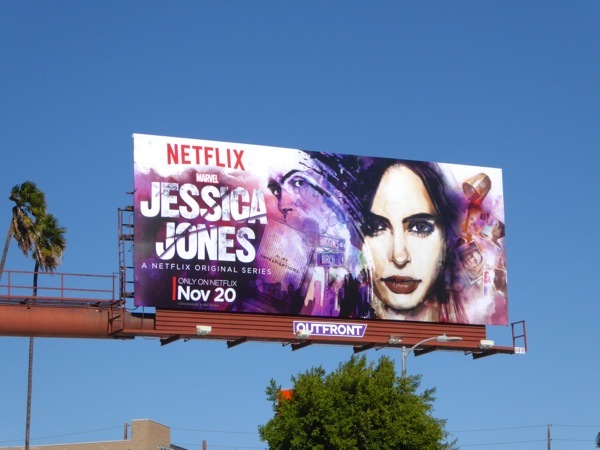 UPDATED: Here's another ad creative for the Netflix show spied along Olympic Boulevard on November 27, 2015, this one also features David Tennant as 'Kilgrave' who's integral to this first season of Jessica Jones.